Investors should not be pleased with NVIDIA's new share buyback program. Over the past three years, graphics-chip company NVIDIA (NASDAQ:NVDA) has been a share-buyback machine. From fiscal 2014 through fiscal 2016, which ended in January, the company spent a total of $2.29 billion repurchasing its own shares, knocking its diluted share count down by about 9%. NVIDIA's mountain of excess cash, as well as consistent free cash flow generation, fueled the company's capital return policy. At the beginning of this period, NVIDIA's stock was in the doldrums. At the start of fiscal 2014, shares of NVIDIA traded for just 7 times earnings after backing out the company's net cash. In other words, NVIDIA was able to buy its own shares for a song. 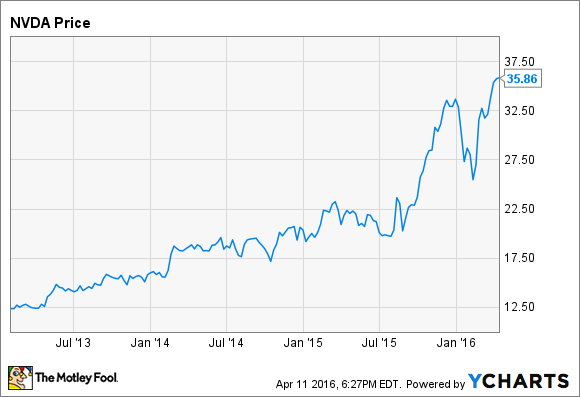 Shares of NVIDIA steadily rose over the following two years and then spiked higher during the second half of 2015. When it was all said and done, the stock had nearly tripled in a little over three years. A few weeks ago, NVIDIA announced that it was entering into an accelerated share repurchase agreement as part of its plan to return $1 billion to shareholders in fiscal 2017. NVIDIA is paying $500 million to receive about 12.1 million shares, with additional shares set to be delivered at settlement, depending on the daily average price of NVIDIA stock. Here's a great explanation of how these accelerated share repurchase agreements really work. A $500 million buyback may sound like a great idea, considering how much cash NVIDIA has sitting on its balance sheet. But because the stock price has increased by so much, share buybacks are the last thing NVIDIA should be doing right now. Price matters when it comes to share buybacks. At the beginning of fiscal 2014, NVIDIA's stock was so cheap, even assuming no growth whatsoever, that buybacks were an excellent use of capital. Today, NVIDIA's stock is so expensive that buybacks are an awful idea. Warren Buffett, in his 1999 letter to Berkshire Hathaway shareholders, laid out his philosophy on when share buybacks make sense: "There is only one combination of facts that makes it advisable for a company to repurchase its shares: First, the company has available funds -- cash plus sensible borrowing capacity -- beyond the near-term needs of the business and, second, finds its stock selling in the market below its intrinsic value, conservatively calculated." On the first point, NVIDIA passes with flying colors. At the end of fiscal 2016, the company had $5.04 billion of cash and just $1.42 billion of debt, leaving a net cash position of about $3.62 billion. The second point, though, is no longer true. NVIDIA is far from inexpensive, even under optimistic assumptions. At a stock price of $36, and after backing out the net cash, NVIDIA trades for about 27.8 times GAAP earnings. That's a far cry from the cash-adjusted P/E ratio of 7 the stock sported a few years ago. Let's look at it another way. At the beginning of fiscal 2014, a $500 million buyback, if it could be done all at once, would have boosted EPS by 6.9%. Today, the same buyback would boost EPS by only 2.5%, thanks to the higher stock price. What if that $500 million were invested back into the business? Using NVIDIA's fiscal 2016 tax rate, what pre-tax rate of return would be necessary to achieve the same EPS increase? At the beginning of fiscal 2014, NVIDIA would have needed to generate a pre-tax return of 9.44% on that $500 million to match the EPS boost of a share buyback. In other words, share buybacks looked like a fairly attractive option at the time, effectively generating a return of nearly 10% guaranteed. Today, NVIDIA would only need to achieve a 3.72% return to match the effects of a share buyback. That's a fairly dismal result. If, instead of a buyback program, NVIDIA had announced that it was investing $500 million in a new project, and that it expected a 3.72% return on investment, some eyebrows would have certainly been raised. But the end result, in terms of EPS, would have been exactly the same. Share buybacks made sense when NVIDIA's stock was cheap. Today, the stock trades at a hefty premium, and while one could argue that the company's growth prospects may justify the price tag, NVIDIA's new $500 million share buyback program is more likely to destroy shareholder value than create it.